My first savory pie. I made this deal with Tammi that I would cook dinner one night a week when I first told her about the whole pie-thing. I get home late on weeknights and she makes dinner all the time. It was a gesture she was happy about, but unfortunately I haven’t been as dedicated to dinner as I have been with making pie once a week. The bummer part is that she’s not a huge fan of sweet pies. So tonight I thought I’d multi-task by making a dinner pie. I pulled a recipe from cooks.com called Weeknight Supper Pie. It’s a recipe that could definately be pimped. It’s an even poorer version of shepherds pie because it doesn’t have potatoes. I thought of making them on the side. You know, to be more edgy. Tammi overruled and we ended up having a salad instead. More edgy! And green! Saute onions in butter until soft and translucent. Add ground beef, minced garlic and basil; sprinkle with salt and pepper. Turn up to medium high heat and brown (do not allow garlic to burn, heaven may fall).Add tomato soup, reduce heat and simmer 10 minutes. Allow to cool.Preheat oven to 375F degrees.Line a 9 inch pie dish with pastry rolled 1/8 inch thick (or use store bought like my lazy self).Moisten edges of crust with cold water. Fill pie shell with meat mixture. Prick top crust and place over pie, brush with melted butter and bake in a preheated 375F oven for 1 hour or if you’re in a hurry, bake at 450F for 15 minutes, then decrease heat to 350 and bake 15 minutes more.Seriously, this recipe could be pimped. I may have to come back to this one with a few mods. But hey, I made dinner, so there. 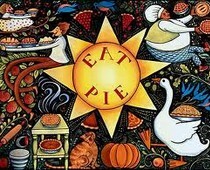 This entry was posted in Dinner Pies and tagged Baking, Dinner Pie, Pie, Recipe, Supper Pie by pieofthebeholder. Bookmark the permalink.